Olowo-n'djo Tchala, the founder of Alaffia was in town recently to speak with several of the food co-ops in the Twin Cities area about the philosophy behind the great body care products his company produces. Olowo-n'djo is a tall, engaging, warm-hearted man who's kindness and enthusiasm are contagious. His generosity even extended to cooking us all a traditional African meal that was just delicious! When Olowo-n'djo was developing Alaffia, he had a big vision. He sought a way to support those living in Togo, Africa, a place where he himself grew up in poverty, that would be culturally, spiritually, economically and ecologically sustainable, all while improving the community. Alaffia is the Fair Trade enterprise that Olowo-n'djo, along with his wife Rose, developed to do just this. Even though many Africans live in a state of abject poverty, their continent is abundant in natural resources. Olowo-n'djo decided that shea butter was the answer that he was looking for. As he states on his website,"(Shea) is a renewable resource of African origin; shea trees are wild, requiring no chemical fertilizers or pesticides. Furthermore, it is an integral part of many savanna communities and, consequently, there is a wealth of local and traditional knowledge of making shea butter." In fact, Olowo-n'djo grew up collecting shea nuts when he was a child in order to make extra money for his family, so he learned through personal experience that collecting shea nuts is very labor intensive. Producing 1 kg of handcrafted shea butter takes twenty to thirty hours of work. Shea trees can be five to ten miles apart from each other which can add up to a lot of walking to gather nuts. Once the nuts are collected, they are pounded, ground, whipped and clarified over low heat by hand. Alaffia uses traditional extraction processes for their shea butter products, unlike many other commercial shea butters made with hexanes or other petroleum products. Olowo-n'djo spoke with us about some of the grim difficulties that his fellow Africans grapple with on a daily basis. The life expectancy in Africa is 41 years of age and 50% of the people there survive on $1 per day. Many suffer from AIDS and other devastating illnesses, and have difficulty receiving the health care that they need. He also told us that deforestation has been a large problem, having lost 5.3 million hectares in the 1990's for example. Olowo-n'djo believes poverty is the true cause of these limitations. Fair Trade offers solutions by paying fair wages and being environmentally responsible. In addition, Alaffia and many other companies who are part of the Fair Trade Federation are fully accountable organizations; all of their books and profit information are easily accessible to the public. 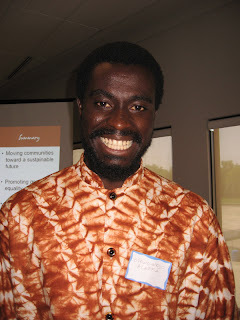 Encountering someone like Olowo-n'djo and a great organization such as Alaffia gives me hope for the future. Alaffia not only provides Fair Trade employment for women in West Africa they are also involved in a whole slew of community empowerment projects that support African mothers and school children, and the environment. 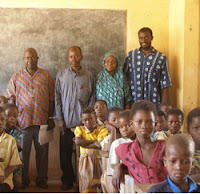 Like the African school children pictured to the left who received new school desks from Alaffia. Read more about Alaffia and their community projects here. Stop on in to Wedge Worldwide to experience the divineness of their hand-made shea butter or check out all of the great Alaffia products that include hand, face and body lotions, a variety of delicious soaps, shampoos and more. Olowo-n'djo stated during his talk that if all of the products that come from Africa were produced under Fair Trade guidelines, eventually Africa would not need financial assistance from other countries and could build a vibrant economy and stable, healthy way of life for its people. Bring this dream one step closer to reality by supporting Alaffia!